‘The Legendary Origin of Perspective: notes on Brunelleschi’s manifesto’ by Anthony Auerbach, paper presented to the seminar The Penisve Image, led by Hanneke Grootenboer, Jan van Eyck Academie, 2007. These notes orginally formed part of my MA dissertation, ‘Models of Representation: A Study in Architecture’s Penumbra’ (MA Advanced Architecture, University of North London [London Metropolitan], 1996). The discussion initated by Hanneke Grootenboer in the seminar The Pensive Image prompted me to revise them. My reflections on the legends of perspective propagated by Panofsky and Damisch follow an extract from Manetti's Life. He first demonstrated his system of perspective in a small panel about half a braccio square. He made a representation of the exterior of San Giovanni in Florence, encompassing as much of that temple as can be seen at a glance from the outside. In order to paint it it seems that he stationed himself some three braccia inside the central portal of Santa Maria de Fiore. He painted it with such care and delicacy in the black and white colours of the marble that no miniaturist could have done it better. In the foreground he painted that part of the piazza encompassed by the eye, that is to say, from the side facing the Misericordia up to the arch and corner of the sheep [market], and from the side with the column of the miracle of St. Zenobius up to the corner of the straw [market], and all that is seen in that area for some distance. And he placed burnished silver where the sky had to be represented, that is to say, where the buildings of the painting were free in the air, so that the real air and atmosphere were reflected in it, and thus the clouds seen in the silver are carried along by the wind as it blows. Since in such painting it is necessary that the painter postulate beforehand a single point from which his painting must be viewed, taking into account the length and width of the sides as well as the distance, in order that no error would be made in looking at it (since any point outside of that single point would change the shapes to the eye, he made a hole in the painted panel at that point in the temple of San Giovanni which is directly opposite the eye of anyone stationed inside the central portal of Santa Maria de Fiore, for the purpose of painting it. The hole was as tiny as a lentil bean on the painted side and it widened conically like a woman’s straw hat to about the circumference of a ducat, or a bit more, on the reverse side. He required that whoever wanted to look at it place his eye on the reverse side where the hole was large, and while bringing the hole up to his eye with one hand, to hold a flat mirror with the other hand in such a way that the painting would be reflected in it. The mirror was extended by the other hand a distance that more or less approximated in small braccia the distance in regular braccia from the place he appears to have been when he painted it up to the church of San Giovanni. With the aforementioned elements of the burnished silver, the piazza, the viewpoint, etc., the spectator felt he saw the actual scene when he looked at the painting. I have had it in my hands and seen it many times in my days and can testify to it. He made a perspective of the piazza of the Palazzo dei Signori in Florence together with all that is in front of it and around it that is encompassed by the eye when one stands outside the piazza, or better at, along the front of the church of San Romolo beyond the Canto di Calimala Francesca, which opens into that piazza a few feet toward Orto San Michele. From that position two entire façades—the west and the north—of the Palazzo dei Signori can be seen. It is marvellous to see, with all the objects the eye absorbs in that place, what appears. Paolo Uccello and other painters came along later and wanted to copy and imitate it. I have seen more that one of these efforts and none was done as well as his. One might ask at this point why, since it was a perspective, he did not make that aperture for the eye in his painting a he did in the small panel and the Duomo of San Giovanni? The reason that he did not was because the panel for such a large piazza had to be large enough to set down all those many diverse objects, thus it could not be held up with one hand while holding a mirror in the other hand like the San Giovanni panel: no matter how far it is extended a man’s arm is not sufficiently long or sufficiently strong to hold the mirror opposite the point with its distance. He left it up to the spectator’s judgement, as is done in paintings by other artists, even though at times this is not discerning. And where in the San Giovanni panel he had placed burnished silver, here he cut away the panel in the area above the buildings represented, and took it to a spot where he could observe it with the natural atmosphere above the buildings. Hubert Damisch asks (himself), ‘What is thinking in painting, in forms and through means proper to it? And what are the implications of such “thinking” for the history of thought in general?’ [note 1] Elsewhere he has said, ‘The problem, for whoever writes about it, should not be so much to write about painting as to try to do something with it, without indeed claiming to understand it better than the painter does, [... to try to] see a little more clearly, thanks to painting, into the problems with which [the writer] is concerned, and which are not only, nor even primarily, problems of painting’ [note 2]. These two statements appear to cross. Are they contradictory? The first part of the first statement is a provocative question and invites us to regard painting at least hypothetically as a model of thought and therefore to ascribe to it, in a profound sense, originality. The second part of the same statement is more ambiguous: it could assign a relatively easy task to the historian, namely to describe how ‘a painter may very well come to formulate, by means all his own, a problematic that may later be translated into other terms and into another register (as happened in its time with perspective)’ [note 3], but this does not yet say anything about the ‘implications’ because such ‘translations’ as Damisch is hinting at tend to be historical fictions evoking premonitions, spirits, mysterious causes and subjectless intentions. This procedure, pioneered by Erwin Panofsky in ‘Perspective as Symbolic Form’ (1927) [note 4] ascribes to painting only priority, and it is hard to see what it can yield other than metaphors of dubious historiographic significance. Thus it would vitiate the idea of a model of thought. Damisch’s second statement suggests that painting may serve as a model not so much for ‘thought in general’, but for writing about painting. And thus, while the field is narrowed, the writer is issued a serious challenge, and is exposed directly to the ‘implications’ that were alluded to in the first statement. A procedure like this requires a special kind of critical tact. Damisch maintains that ‘perspective tends toward discourse as toward its own end or reason for being; but it has its origin [...] on that plane where painting is inscribed, where it works and reflects on itself and where perspective demonstrates it’ [emphasis added, note 5]. Damisch’s ‘but’ appears to mask a reversal of the ambitions expressed by the two statements I cited above. Although it appears in the guise of a ‘finding’ in the last sentence of his book, the assertion that ‘perspective tends toward discourse’ is really the reiteration of a premise. Moreover, it seems to narrow the expectations Damisch holds out with the concepts of paradigm or model. Damisch’s ‘tactic’ is to adopt from the outset an idea about grammar which is peremptorily applied to perspective despite the qualifications and minute observations that occupy the author for more than four hundred pages. The wealth of references that Damisch offers tends to make the basic suggestion highly complex, even fragile, but he does not actually argue his case. He asserts, ‘The formal apparatus put in place by the perspective paradigm is equivalent to that of the sentence, in that it assigns the subject a place within a previously established network that gives it meaning while at the same time opening up the possibility of something like a statement in painting: as Wittgenstein wrote, words are but points, while propositions are arrows that have meaning, which is to say direction’ [note 6]. Damisch would probably accept that the rationalities of language, geometry and painting are on different ‘registers’. However, I would be hesitant to suppose that the translations between them are as easy as he makes them. It is as if Damisch wants to say what he thinks painting shows. He puts himself in the position of advocate of painting that has chosen to remain silent (and painting surely has its reasons for doing so). Far from being so easily subsumed by discourse, or as Damisch seems to suggest, destined to be subsumed by discourse, painting might also be indifferent or hostile to discourse, even when it deliberately provokes it. Painting does not speak up, but also it does not — to employ a Damischian trope — run away (discourir). If one of painting’s strategies is silence, it could still be a model of thought, but one that does not offer an imprimatur. While Damisch’s tactic succeeds in launching a discourse, perhaps at painting’s expense, my suggestion would seem to call it to a halt. Yet it is here that I would place the potential of a study of perspective to help elucidate painting’s configuration of representation historically, precisely in the way Damisch asks, in forms and through means proper to it. The Origin of Perspective hints at more than one sense for ‘origin’. Damisch crosses the idea of origin as source or beginning familiar from historiography with the origin we find in geometry (the intersection of axes) and profits from the ambiguity he has created. He is nonetheless detained at length by the legendary origin, or invention of perspective. This is particularly fertile territory for Damisch because the achievement attributed to Filippo Brunelleschi of demonstrating rational perspective for the first time is known only by literary remains. The two panel paintings Brunelleschi is said to have made were lost a long time ago. As a result there is considerable controversy among scholars about when they were done (dates have been offered ranging from 1410 to 1425), what they looked like, and exactly what method Brunelleschi used to make his famous manifestos. The most important source, The Life of Brunelleschi	by Antonio di Tuccio Manetti, believed to have been written in the 1480’s, is vague on all these points. The legend has acquired an almost mythological import, complete as it is with hero, secret recipe and miraculous outcome [note 7]. I do not need to add my own speculation on the matter. Manetti is precise enough about some unusual features of Brunelleschi’s panels to suggest how these could reveal some important aspects of the perspective configuration that were not so clear afterwards. This concerns the position of the subject emphasised by Damisch, and the meaning of the so-called vanishing point or, as it is sometimes called, the eye-point. I will not give a full account of Damisch’s interpretation of the Brunelleschi episode, which contains a detailed, if unsystematic survey of the literature, some valuable, if uncontroversial insights, some very obscure conjectures and some blunders [note 8]. I shall try to make what follows as straight-forward as possible. According to Manetti, Brunelleschi first made a painting of the Baptistry of San Giovanni and the surrounding area as seen from the doorway of the cathedral. What marks this painting out from the pictorial tradition until then and afterwards (apart from the fact that Brunelleschi was not a professional painter) is the pedantic nature of its method, which seems to far outweigh the importance of making a painting of the Baptistry. This is what makes the designation of it as a manifesto apt. However trivial the topic might have been compared with the routine expectations and ambitions of fifteenth-century painting, it would have brought the painter to a public place to do it. By asking the viewer to approach the painting from the back, Brunelleschi declared first of all the opacity and materiality of the panel. The picture itself stood opposite the Baptistry instead of in front of it. The peep-hole offered in the first place a view of the Baptistry, then in a dramatic and, one is tempted to say, symbolic gesture the introduction of the mirror caused the panel reply with the image of the Baptistry. Only then did the viewer find his (or her) position in the painting. Alberti’s rhetoric on the other hand, introduced a certain equivocation. He marked the same spot, but this time as the centric point, where the prince of rays rules, and towards which the lines receding parallel to the line of sight — the ‘orthogonals’ of his perspective pavement — bend themselves. This was not quite the ‘point at infinity’ which mobilised many extravagant commentaries, but it does take on the appearance of a point quasi a priori, independent of the subject. Alberti’s emphasis appears to shift attention from a demonstration of the possibility of representation, with all its subjectivity, to the apodixis of geometry, with its connotations of ideal and objective truth — not that Alberti goes so far as to give the mathematical proof he leaves no doubt he has up his sleeve. The order of things in which Alberti places both the subject and the painting is much more obscure than what is suggested by Brunelleschi’s demonstration. The equivocation seems to be between displaying the centric point as the rule that governs the image, and dissimulating it (in any number of ways) as the site of the subject. It is possible to understand the tendency of obscuring the vanishing point — whether by putting something in the way in a painting or by hinting in theory that it lies infinitely far away — as a tendency toward dissimulating its subjectivity. What is it that gives Brunelleschi’s manifesto the status of an invention? The geometry and the scientific optics that Brunelleschi knew were not at all primitive, but there was nothing in them to suggest a way of making naturalistic pictures. The innovative concept was the intersection, as Alberti called it. The innovative technique, the invention, was what we call the picture plane. Painting on a flat surface was nothing new, but previously it did not define painting, nor were flat painting surfaces necessarily the norm. 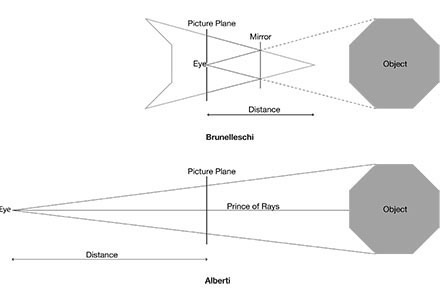 The picture plane that Brunelleschi demonstrated in his complication of perspective is a new kind of object. It is an object with a special and possibly unprecedented ambiguity. (One might add: a fateful one, because henceforth irrevocable.) The ambiguity arises out of the fact that what is at stake is appearance. In short, we perceive as objects both the thing depicted ‘in the picture’ and the picture itself. The picture plane is the substance which bears the lines and colours proper to painting. However, the intersection, in its concept, denies that substance, in so far as the space ‘beyond’ the picture plane is supposed to be continuous with that before it. The paradox for the painter is that to depict something, the picture as an object must have the utmost integrity if it is to succeed in disappearing. Alberti’s declaration that the painting is ‘an open window through which the subject to be painted is seen’ [note 11] masks an avoidance of this paradox. The geometry of the picture plane — the amazing convergence of parallel lines — is only surprising if it is interpreted as a Euclidean plane, instead of as a plane of projection. The desire for truth-to-appearance which is demonstrated and tested in Brunelleschi’s manifesto (whether is was sought for its own sake or for the sake of the historia, as Alberti has it) precipitates in painting a new form of representation. Although painting always operated as much by resemblance as by any other means and is not entirely reducible to picture-writing, the predominant mode of signification of painting before Brunelleschi made his mark was (crudely speaking) ‘symbolic’ in the following way: the sign stands in a relation of identity to what it signifies. It stands for the latter, is arbitrary, objective and relative. When painting assumes the mode of signification that Peirce would call ‘indexical’ (though it hardly relinquishes its symbolic moments). It stands in a mediated relation to what it signifies. It stands against the latter, is contingent, subjective and absolute [note 12]. In the first case, painting things is like naming them. The meaning of the painting thus depends on borrowed systems, arguably, is not proper to painting. In the case of Brunelleschi, the painting represents a complete situation, that is, complete with subject, object and what’s in between [note 13]. Hence it is closer to being a proposition in its own right in the way Wittgenstein uses this term — ‘Situations can be described but not given names. (Names are like points; propositions like arrows — they have sense. )’ [note 14] — which is perhaps why Damisch felt that perspective tended towards discourse, but I think he misreads Wittgenstein’s clues. Wittgenstein’s theory (in the Tractatus) is instructive because what it aims to elucidate is the structure of language, that is, the structure of representation. It is not far-fetched to suggest that this is also the point of Brunelleschi’s demonstration. The discipline that would characterise a demonstration could explain the eccentric manner in which Brunelleschi executed his panels. This demonstration has the right to be called a ‘proposition’ if we accept, with Wittgenstein, that ‘A proposition is a model of reality as we imagine it’ [note 15]. Wittgenstein’s theory is not needed however to show that the power of representation that Brunelleschi demonstrated does not stem from his use of geometry (if he used it) but from the fact that the perspective configuration has the structure of a model. The perspective configuration keeps this structure even when it fades into the background [note 16] or is asserted only in symbolic form.